Stolen motor car parts recovered from a dam. The Motor Squad was formed in 1930 to investigate offences involving motor vehicles and in the late 1970’s comprised twenty designated Detectives supervised by a senior Detective Sergeant. The most prevalent offence confronted by the Squad in those days was that of motor vehicle theft and although about 89 percent of those vehicles were recovered, parts and accessories were found missing from a large number of vehicles. In 1972 motor vehicle manufactures were compelled by Commonwealth legislation to fit anti-theft devices and a decline in the theft of vehicles fitted with these devices became apparent although the overall theft rate continued to increase. The motor industry continued to grow and under the Motor Dealers Act 1974 there were approximately 5,000 licensed motor dealers in the late 1970’s. The activities of these dealers were policed by the Motor Squad together with the Department of Consumer Affairs and many prosecutions were launched not only against dealers, but also against persons who had committed offences on dealers. ‘Hit-run’ accidents were a grave concern to the Motor Squad. 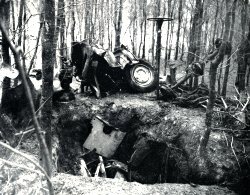 These types of accidents usually occurred in the hours of darkness, and often in remote areas, witnesses were difficult to locate. The Department of Motor Transport, as it was then known, allowed the use of its computerised records which proved to be of valuable assistance in the investigation of offences involving motor vehicles. The Motor squad was supervised by a Senior Detective Sergeant and comprised twenty Detectives who had been specially selected for their ability and aptitude in this phase of criminal investigation. Their inquiries took them to all parts of the Commonwealth and whenever possible to motor vehicle racing meetings in New South Wales.